Edward A. Shanken (2009). 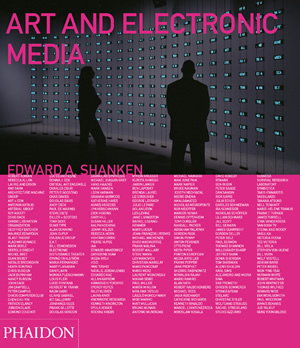 Art and Electronic Media. A real-time frame capture from Char Davies' VR installation Osmose (1995). © Immersence. This VR environment consists of a dozen distinct world-spaces that immerse the participant in several archetypical realms of nature, including Forest, Leaf, Clearing, Pond, Cloud and Abyss. Viewed through a head-mounted display, the first vision is a Cartesian Grid, which provides spatial orientation. This dissolves into a forest upon the first few breaths that the motion-sensitive vest detects. Users can regulate their location on a vertical axis by inhaling or exhaling deeply to ascend or descend. Turning and leaning alter one's view and location on a horizontal plane. A variety of virtual worlds may be conjured and navigated through these behaviours. Each environment is somewhat abstract, semitransparent and fluid, rather than strictly representational, and the boundaries between them are equally amorphous. Visitors may hover above or between them. the divisions between them blurring. There are two other levels: Code, a substratum of software strings that were actually used to create the programme, and Text, a super-stratum of quotations about the body, technology and nature. These virtual bookends encapsulate the actual encounter in the computational and theoretical foundations of its creation. After fifteen minutes of immersion, the participant is brought back to reality slowly, but a lingering memory of a transformed sense of space and consciousness remains. Char DAVIES [b. 1954. Toronto) lives and works near Montreal and in San Francisco. She is best known for her virtual . environments and works with a variety of different media. Her work explores nature, the human psyche and perception, while addressing the paradox of being in nature in an immersive virtual space. Her projects have toured internationally and have been exhibited at the Musee d'Art Contemporain, Montreal (1995), and at HEAP Biennale of Electronic Arts, Perth (2001).